There are a few map generators made for the game. This is the new online map generator for the game! 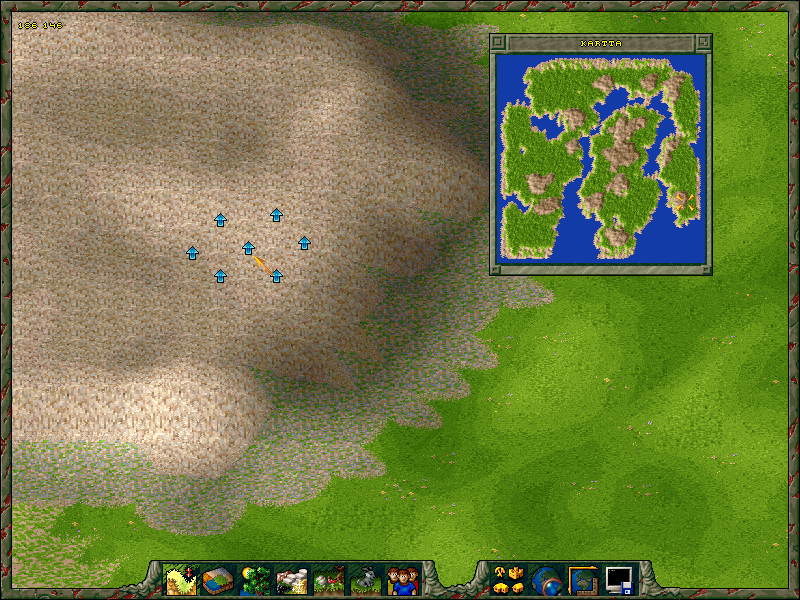 It generates maps compatible with both The Settlers II as well as Return to the Roots, adding in features that have not previously been available! Go ahead and generate maps right away! Maqs made a map generator based on simplex noise pattern. Note that the maps generated are geared towars Return to the Roots and are prone to crash in the original game. 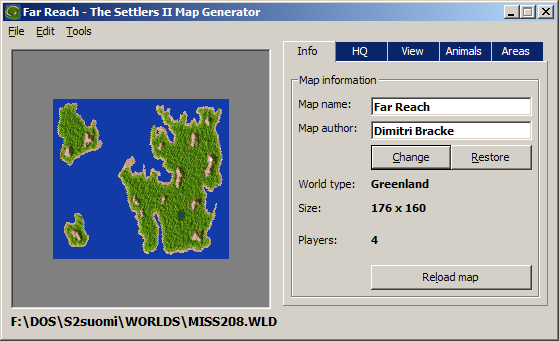 This map generator is now considered fully obsolete: it was made in 2005 – 2006 when most of the map files were still unknown. This information is left here for historical reference. This generator does not provide perfect maps. 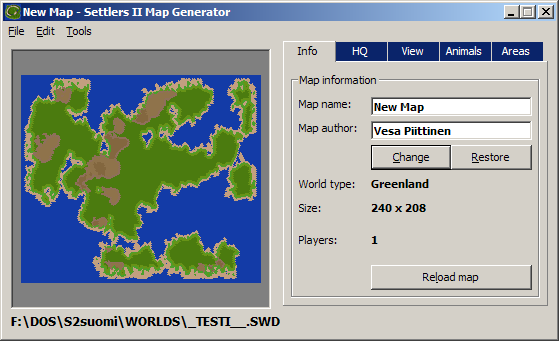 Instead it makes the use of Blue Byte’s own map editor a whole lot easier by providing a random landmass. 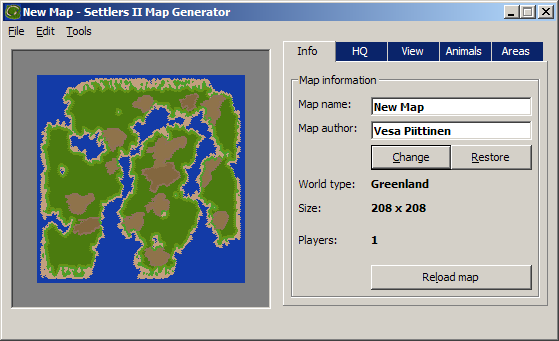 The landmasses generated by the map generator are of very high quality and after a few click you will certainly find a map that pleases your tastes and needs. Then save and launch the game’s map editor to decorate the map! Also, once you have finished your map you can open the map again in the map generator. This time around you can apply a coastal castle fix, converting all castle tiles on coast as coastal castle tiles. Once saved again the map can then be used as a mission replacement map that lets you build ships – in your map! This map generator is also available as a special gift download at GOG.com – and don’t worry, with a permission as this map generator is written by me. There will be no further versions released. This program was written in Visual Basic 6 and since then I’ve lost the source code as well as my interest in writing any further code in such an old & unsupported programming tool. As you can see, some shapes generated by the map generator are very interesting. The map terrain is slightly randomized so you don’t need to look at boring flat ground, giving your maps a professional look and feel! There is a lot of variety! And don’t worry, the map size is random as well, these sample images have big maps only to give a good idea on how much less work you have to do. Where do we put the resultant .swd files? The filename should limit to eight characters for legacy reasons, ie. AWESOMEMAP.SWD is too long, but AWESOMEM.SWD is OK. Otherwise you may have some issues, like the filename of the map may appear as AWESOM~1.SWD and if you have more than one that start with the same name the number after ~ keeps increasing. This is probably something everyone else here has long ago figured out, but in terms of map design, I’m starting to learn that it’s hard to have a game with several distinct islands, where each player is on a different island. I have a game running currently where the human player is on one island, and all the other players are on a different island. The ‘nut’ that designed the map (no guesses who that was! ), only made one location where the island could be entered with a harbor. For the life of me, I can’t get one of my boats to steer down there to land there. Maybe there isn’t enough room or enough open water to do it. And even if there were multiple places to plant a harbor, all of those places are now taken up by the enemies, and there’s no place to land. But there I sit — I have an army of soldiers chomping at the bit to go take them over, but I can’t do anything if I can’t land on their island. If I understand you right this map is just bad 😉 Maybe there is a file missing which blocks some positions that you can land. You had the same problem at the 4th map of the settlers2 missions – the yellow player sometimes took the point where you can land. So, at the moment you can end the game because you can not go the other island – or you play RttR then it is possible but I think thats not what you want. I guess you could edit a map with mapeditor adding few more spots with castles, then i use s2mapgen to use castlefixtool to make castle places into harbors save as .swd replace with mission, while changing mission name in mission folder. I just tried installing ‘Return to Roots,’ but I don’t think I know what I’m doing. It says that s25update.exe is not compatible with the version of Windows I’m running. I think that’s where I’ll stop, lest I mess something up. Maybe I downloaded the incorrect version? To make ships you click on a Shipyard and click the button that has a boat in it. It changes into a ship and then the shipwright builds ships instead of boats. The map editor probably needs a graphical guide, I don’t think I can fit any good advice in a short comment. Sorry friends, but I installed everything perfectly. Using Windows 7 Home Premium x86, but when I click the map editor in the game folder, it says not a valid win32 application. I would be very happy if they could help me. I really love this “The Settlers II” and he made ​​me happy at times when everything was against me. I think this just means, that you have to use WinXP as far as I understand that problem. Use dosbox to run your settlers 2 programs in windows 7+ i can get it to work in vista with out dosbox but runs smoother with. I have the same problem as Andrew. The button in the shipyard to switch from boats to ships is not available on my own maps. Is there anything else one has to change? Harbor building is only available in Roman Campaign. This means you have to replace one of MISS2##.WLD maps with your own map (and you may want to adjust available resources by editing RTX files in a text editor such as notepad). I made beautiful and very hard map for experienced players of settlers 2. It is full of harbour and there is lot of the fun. If you have a mood to try it do so and enjoy. I still can’t see where to save .SWD files that s2g recognises – I have a MAPS, MAPS2, MAPS3 & MAPS4 folders and SWD files don’t get recognised if I save to them. The files go to WORLD folder right in the root folder of the game. They can than be found and played via Unlimited Play. It is possible to replace the .WLD files as well, but doing so also requires editing mission .RTX files, which can be a little troublesome at first. However that way it is possible to play maps with ships. Hi – I don’t have a WORLD folder in the root folder – I have DATA, DRIVERS, GFX and SAVE in the root folder. Should I create a WORLD folder and stick them in there? Are you sure you have the Gold Edition? It should always ship with Map Editor (s2edit.exe) and WORLDS folder should exist. PS – Is it WORLD or WORLDS? WORLDS. The description doesn’t sound like a regular Gold Edition; I think back in the day some folks were spreading an odd “full game” pack that wasn’t the real thing, but some self put together version that just happened to work and had that save slot editor s2edit.exe with it. Ah, maybe I have that then 🙁 Do you know where I can get the “proper” edition? Finding a more questionable copy is easy enough via Google. I can afford the £6. Thanks very much for your help! I downloaded from GOG.com and now have the correct version and everything works fine – the other version I had was obviously cracked for the cheat. Thanks again for your help! To anyone interested in creating their own scenerios I can recommend an app that I created. It automates the process of replacing campaign missions with custom maps form WORLDS folder and allows to set some nice stuff like custom alliances, barriers, starting merchandise/workers and even victory condition and simple story. I’ve made it mostly for myself, but maybe someone will find it helpful too. It’s only running on windowsXP (maybe win95 too) so sadly I can’t make any screenshots. If only it was possible to add bookmarks which would add mission bobs and exchange specific castle location to a harbor location directily from map editor.